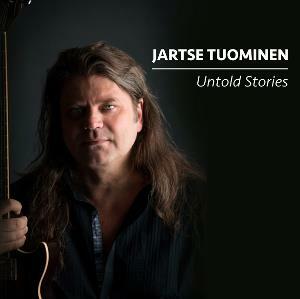 Untold Stories is the fifth album by the Finnish, internationally respected guitar master Jartse Tuominen, 11 years since the preceding one. All ten tracks here are instrumentals and pretty much centred around the electric guitar. The band involves musicians (keys, bass, drums) from both USA and Finland and the recordings were done between 2014 - '15. Recently Jartse began a tour that starts here from Finland. To me personally this kind of stuff oriented towards technical delivery rather than the emotional, more introspective depths of the music is usually a bit tiresome. The first three tracks are just that: energetic and spicy rock-fusion but in the end quite meaningless boasting. 'Time to Go' then is The Love Ballad of the album, and as such easily a highlight as well. A relatively slow tempo, and soaring guitar melodies filled with passion, melacholic longing for the loved one. The composition was made into a very romantic promotional video featuring the beauty of Finnish nature and summer evening by the lake with sauna and all. Have a look, you'll surely find it in the net. The sixt track 'Trouble Shuffle' is a shameless roots piece, something I really don't enjoy. 'Untold' is another slow and sentimental tune comparable to 'Time to Go'. At first it has some nice acoustic guitar, and the majestic lead for electric guitar may bring some of the most grandiose CAMEL instrumentals to one's mind. Also the organ and piano appear to a good effect. 'Nine Lives' returns to the rootin' tootin' blues-rock. The last track 'Farewell' is the album's third step into the sentimentality. Definitely this is a well-done instrumental rock album and warmly recommended to all who appreciate the guitar heroics of artists such as JEFF BECK, GARY MOORE or JOHN McLAUGHLIN. There's nothing especially progressive, and I'm afraid the whole is very evidently divided into three types of tracks: the ballads that are very enjoyable if not the most original pieces of music, a couple of openly rootsy tracks, and the majority of more or less ordinary guitar centred rock-fusion tunes to make the impression on the technical lavel instead of compositional substance. Maybe it's just me that they mostly leave me unimpressed. A solid three-star album anyway. Collaborating with another kind of composer would probably bring the very best out of this excellent musician.